One of the most beautiful picture books I’ve read this year, this story about the power of imagination marries the wondrous lyricism of both illustration and text so that the reader becomes completely immersed in the narrative, the emotion and the possibility of the story. Eliza picks up a stone from the beach. But this is no ordinary stone. She is determined in her knowledge that it is an egg, and is not surprised to find that the stone cracks and a stone bird appears. An alive stone bird. And yet also, by the end, the story explores the ability to let go. The narrative clearly takes the perspective of Eliza, but what brings Eliza to life for the reader, in the same way that the stone lives for Eliza, is not only Eliza’s speech, which is particular to her and encompasses her character, but also the expressiveness of her personality through her relationship to her friends, her school, her playing. The illustrations are exquisite. The shifting perspective of the illustrator – seeing Eliza sometimes from above, sometimes up close, sometimes from the back – allows the reader an intimacy with the protagonist. We see how strands of hair pull across Eliza’s face, how she holds her pencil, how she lets her sandals slip from her feet, her scuffing through autumn leaves, and the crouch position on her haunches as she scoops the pebble from the sand. 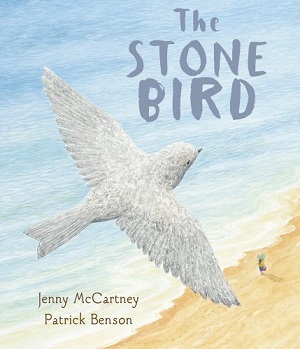 Because Eliza experiences such joy and pain with her stone bird, such frustration and satisfaction at different times, the reader is constantly aware of the nuances in her emotional state through her behaviour. The delight at first discovery, the irritation and sadness at her mother’s skepticism, the wonder as the bird emerges, even the concentration as she colours in a drawing. There is so much attention to detail and close up that readers will feel as if they know, or indeed, have become Eliza. And also the ability of the author/illustrator to understand when to flood the page with illustration, such as the double page magic of the Christmas spread. It feels intimate, homely and yet imbued with a hint of wistfulness too. A compelling, lyrical, superbly illustrated picture book that matches the power of imagination with the power of books. You can buy it here. Can We Talk About Fortnite?